Hundreds of potential clients have sought advice on how 3D printing could revolutionise their businesses from a group of South Derbyshire-based experts. The SYS Systems stand at the three-day TCT Show at Birmingham’s NEC has been awash with visitors keen to explore the very latest technology being offered by the company. A Stratasys platinum partner and part of the Foston-based Carfulan Group, SYS is exhibiting from September 26 to 28, performing live demonstrations using the very latest 3D printing innovations and explaining how these are shaping the future of global manufacturing. 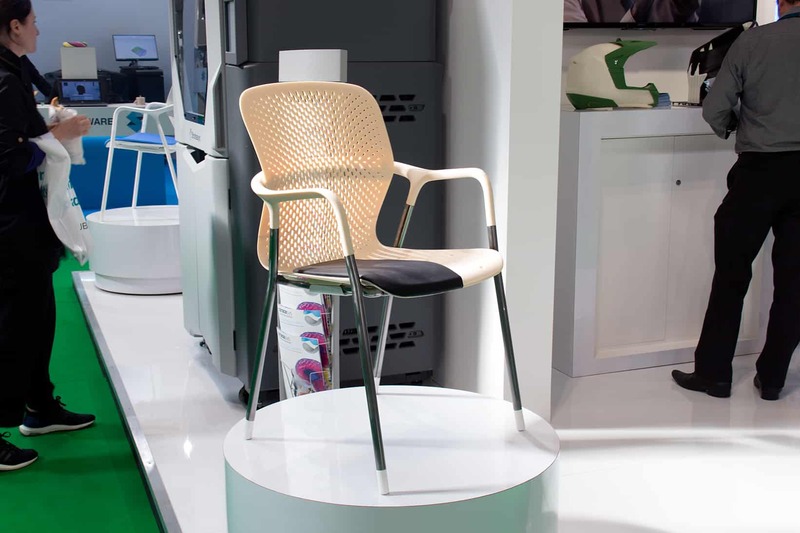 A Herman Miller prototype Keyn four-legged chair on display has proved a major draw – it was created using the Stratasys Fortus 3D printer and is being showcased alongside the company’s finished product, which has been rapidly perfected since it implemented this Stratasys prototyping technology into its development process. Also available to view are machines from SYS Systems’ new FDM F123 series, which was launched earlier this year and comprises three advanced compact 3D printers that use Stratasys-pioneered Fused Deposition Modelling (FDM) technology to enable manufacturers to create prototypes on-site. Rob Thompson, SYS Systems Sales Manager, said: “It’s been a very successful start to the TCT show. Our eye-catching stand is in a fantastic position, visible as soon as you walk through the door, and people have been extremely keen to come and see our kit. “We’ve spoken to a whole range of people from sectors such as aerospace, medical, automotive and education, as well as service providers, and have received lots of positive reaction and interest in our machines. The SYS Systems stand, found at location D22, is hosting a Fortus 450mc machine alongside a selection of PolyJet systems such as the Objet500 Connex3 and the Objet30 Pro. The advanced triple-jet Objet500 Connex3 has the ability to incorporate dozens of colours into one detailed prototype, building anything from vivid opaque to stained glass-like translucent models, with hundreds of blended hue variations. The Objet30 Pro, meanwhile, is ideal for consumer goods prototyping with the accuracy and versatility of a high-end rapid prototyping machine, but comes in desktop size. Its offering includes a choice of eight various 3D printing materials, including clear, high-temperature and simulated polypropylene, and boasts the industry’s best print resolution to create realistic models quickly and easily in-house. If you’re visiting the TCT show this week, don’t forget to visit SYS Sstems on stand D22.